After the cess pit of a campsite and the 400km ride the day before, it was a welcome treat to have had a bed for the night and to wake to a breakfast of coffee and pastries. As we were the only guests the hotel owner had even valet parked our bikes in the restaurant overnight. 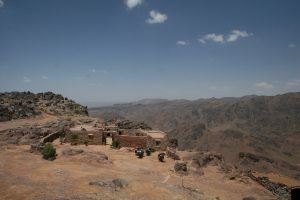 The plan today was to cross the High Atlas mountains all the way to the mouth of the Dades Gorge. The “road” had long since ended and the path through the mountains was nothing more than a dirt track more frequented by cattle than vehicles. With the bikes all packed up we headed off to refuel to find the whole town was without power. No power = no petrol pumps. The options were either to hang around waiting for the power to come back on or set off with only the fuel we had on board and hope we didn’t end up stranded in the middle of the mountains knowing that there would be no villages for 100km either side of us. After a group discussion we decided the sensible option was to wait for the power to come back on, so we ignored that and steamed off up the mountain. 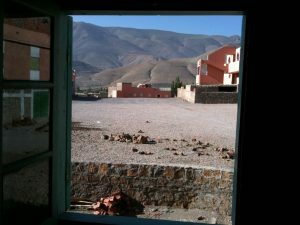 Imilchil is over 2,000 metres up and our route through the High Atlas would take us to over 3,500 metres (due to a slight navigation error, see episode four, ahem). With temperatures at night plummeting compared to the daytime we really didn’t want to get stranded overnight. Our tactic was to keep a slow and steady pace using as little fuel as possible. Unfortunately, conditions conspired against us. The track was strewn with rocks and was so bumpy that trying to maintain throttle control was like trying to not spill your pint on a bucking bronco. On top of that the gradient was so steep that we had to drop down to first gear and generally nail it to get anywhere. On the plus side the scenery was amazing, only spoilt by the fact that if you took your eyes off the track long enough to marvel at the surroundings you either hit a rock and fell off or got vertigo and fell off. After a couple of hours of steep ascent we crested a summit to be greeted by a view all the way down the valley as far as the eye could see. All the way to the Sahara itself. In the face of such an awe inspiring panorama, we decided it must be time for lunch. From here on in “lunch” took on a new meaning. We now had to carry food impervious to both scorching temperatures and being rattled around constantly on the back of the bikes. We needed sealed or dried food with a half life of several thousand years. Or put another way, Lithuanian army rations. Kaspars had used a contact to secure us a job lot of army rations, the only problem being that with the ingredients written in Lithuanian we had no idea whether we were eating Tuna pasta or depleted Uranium. You have to be slightly wary of a brown stick that looks and tastes like chocolate but which doesn’t melt at 40 degrees. And so the daily ritual of “Ration Roulette” was born. Whilst unpacking the food and firing up the petrol stove (having momentarily forgotten we were supposed to be conserving fuel) a goat herder appeared. It never ceases to amaze that no matter how remote you think you are a local will always appear as if from nowhere. If it had taken us three hours to reach here by moped and we hadn’t passed a single house, where the hell were he and his goats going? Bizarrely the only other humans we’d seen all day were three lads from Manchester in a Volvo coming the other way. The herder and his goats eventually meandered over all smiles. After climbing on Oz’s moped and posing for some photos he then tried to charge us for the pleasure which failed so he switched his attention to the contents on the stove. After a few nods and the motioning of his fingers in to his mouth we got the jist that he was hungry. We bunged him a sealed foil bag of something which he seemed delighted with until he actually tasted it and then started spitting it out all over the floor and gagging slightly. He wiped his mouth and shuffled off without saying anything, head bowed. Obviously not as hungry as he made out then if he could afford to be picky about it. It was only later that we realised we’d tried to feed a Berber pork meatballs in beans. This did raise the question though, how does someone who doesn’t eat pork know that they are eating pork? Anyway, we rid ourselves of any guilt by blaming the Lithuanian army for not writing things in English. 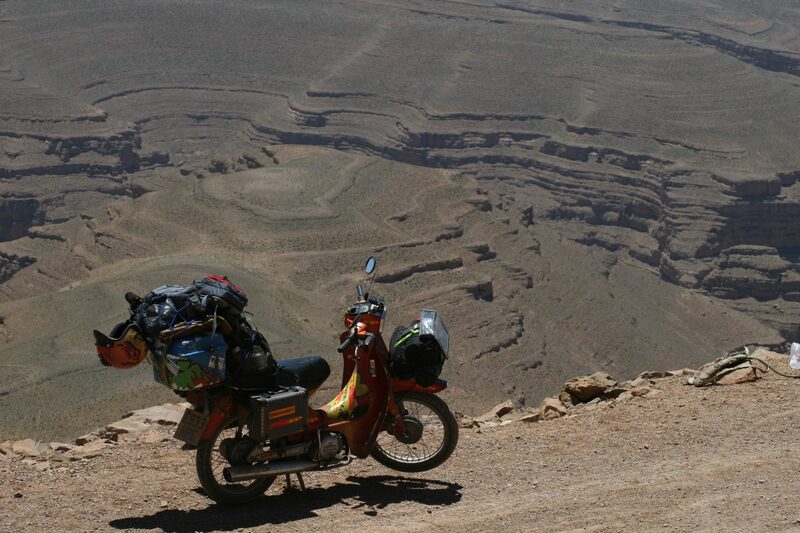 After a hearty lunch and a quick check round the bikes to check that nothing essential had fallen off we pressed on towards the horizon as the temperature continued to soar. By mid-afternoon we were really starting to flag. 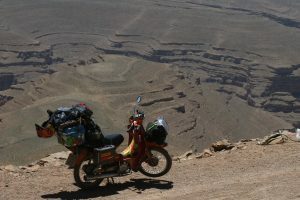 The combination of the terrain, heat and dust was tiring on the body and the eyes and the problem was there was absolutely no shade of any description since we were now well above the tree line. Enter, Hotel Tizi, a “hotel” of such randomness that it wouldn’t have been all that surprising if it was staffed by pandas. 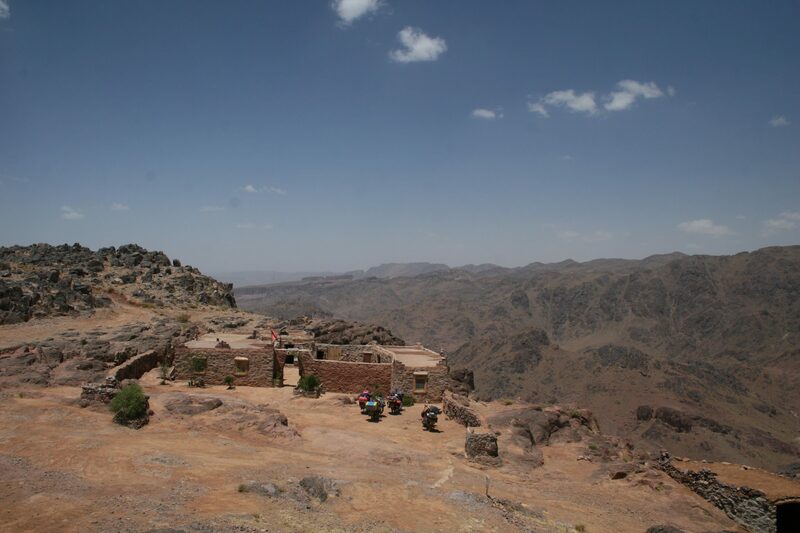 Located on a mountain top, it was hardly prime High St location. At best, that day they would have had passing trade consisting of us and three blokes in a Volvo. We were enticed in by the thought of an ice cold Coke but alas although they had a fridge with a plug on it, there was no plug socket to put the plug into so it was basically a cupboard with a glass door. We asked for water but they explained the water had to be boiled. So we settled on the only thing that was available, steaming hot coffee. In the circumstances it was not as horrendous as it sounds. To be honest anything that wasn’t warm water from our Camelbaks was a welcome change. The combination of caffeine and 18 sugars was actually a good pick me up and set us up for the remaining four hours or so it would take us to descend down to the mouth of the Dades Gorge. But what a ride. That is a route you could do repeatedly and never get bored. At the bottom as we got low enough to be in shadow the temperature cooled and we took the opportunity to wade into the cold refreshing waters. We set up camp nearby ready for the final push towards our ultimate goal, the Sahara desert, where events, including the temperature, were set to go up a notch or two.